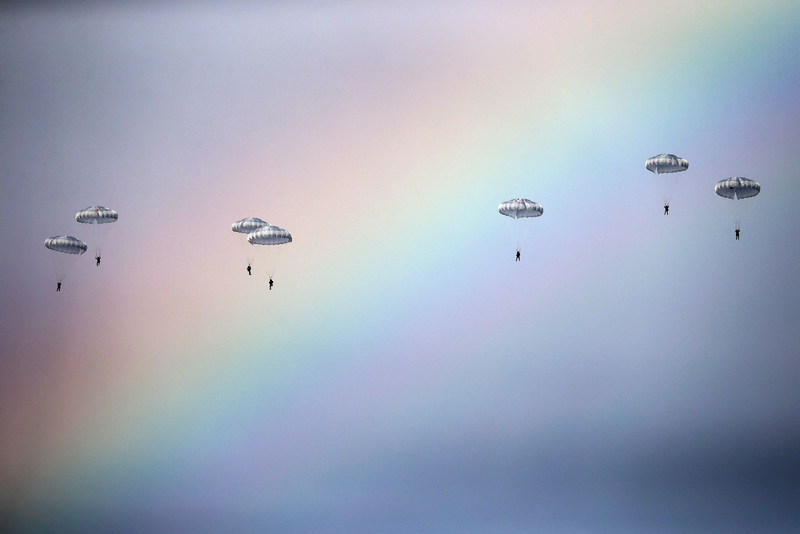 Russian paratroopers jump past rainbow from an IL-76 transport plane during a joint Serbian-Russian military training exercise "Slavic Brotherhood" in the town of Kovin, near Belgrade, Serbia. The Slavic Brotherhood 2017 exercise that will involve Russian, Serbian and Belarusian troops will take place in June in Belarus, Belarusian General Staff Chief Major-General Oleg Belokonev said. "Belarus will host the Slavic Brotherhood 2017 exercise in June. These maneuvers have been included in the program of international military cooperation of the three countries. We have not decided on the scenario of the exercise but I think that it will be of an anti-terror nature as well," Belokonev said. According to the General Staff chief, such maneuvers allow practicing combined command and control and learning to operate in new theaters of operations. During the maneuvers, the troops will be able to see how the other countries train their special operation units. The Slavic Brotherhood 2016 exercise is being held near Belgrade in Serbia on Nov. 2-15. The first Slavic Brotherhood exercise involving a Russian Airborne Force mountainous large unit was held at the Rayevsky training range near Novorossiysk in south Russia in 2015.